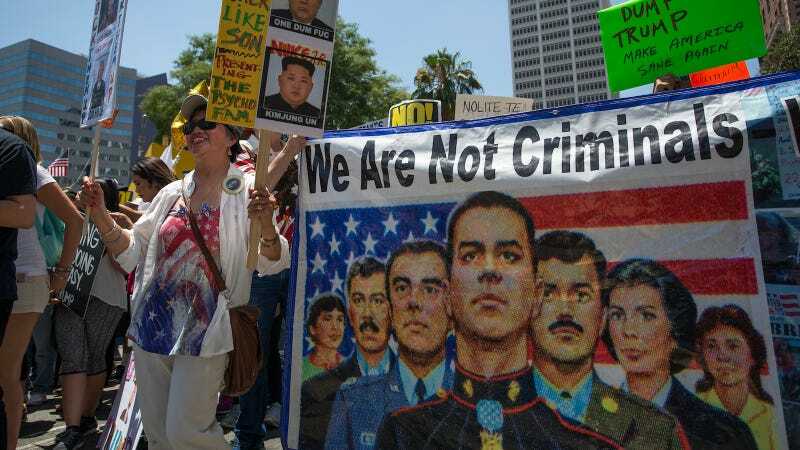 A banner references immigrants who serve in the U.S. military but face possible deportation during the Impeachment March on July 2, 2017 in Los Angeles, California. Image via Getty. Miguel Perez, Jr. has lived in the US since he was eight years old. He served two tours of duty in Afghanistan; he was later convicted on a drug charge and served time in prison. Just before his release in 2016, he was transferred to an ICE detention center, and is now threatened with deportation to Mexico. The Chicago Tribune reports that Perez began a hunger strike earlier this week, in protest of his deportation. His lawyers and doctors believe Perez is suffering from post-traumatic stress disorder and a brain injury incurred during his army service, both of which have been improperly treated since his release. “They know you’ve got weapons training, military training, strategic training, you have ins with people in the United States, you’re going to work for us,” he said. Perez was diagnosed with PTSD at the Veterans Affairs hospital shortly after his general discharge from the military, which was for a minor drug infraction that isn’t specified. He was supposed to return to the hospital for further treatment, but was picked up in 2008 for passing 100 grams of cocaine encased in a laptop to an undercover officer. He was given a 15-year sentence, and served half of it. Perez has two children who are US citizens, and was a legal permanent resident before his conviction. He mistakenly thought that his oath to protect the nation when he joined the army guaranteed citizenship. The process of citizenship can be expedited by military service, though Perez says his superiors never aided him in that effort. Bergin has filed a stay for his deportation on the grounds that Perez did not receive the mental and physical care he should have after his discharge or while in prison, and on a retroactive bid for citizenship for when he joined the army in 2001.